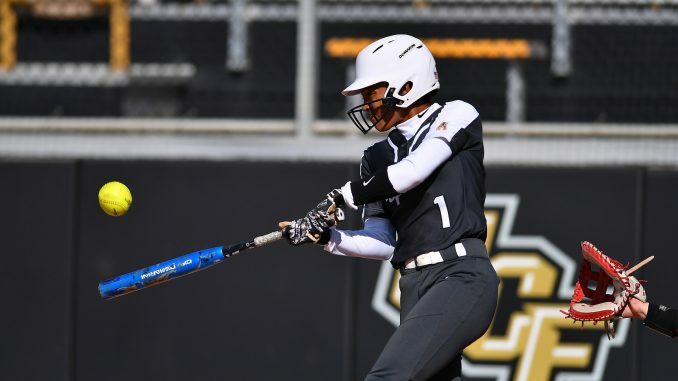 UCF Softball opened its 2018 campaign on Friday by splitting a doubleheader in the Friends of Jaclyn Invitational, first losing to Louisville 5-3 before beating Butler 5-1 in game two. The season opened on a sour note, as the Cardinals put together a three-run first inning to put the Knights in an early hole. Tamesha Glover singled in a run in the bottom of the fifth to cut the deficit to 3-1 before Louisville came back in the sixth with a two-run homer from Jenna Jordan. UCF put two runners on in the bottom half of the sixth, but couldn’t push anything across. The Knights loaded the bases with two outs in the bottom of the seventh and scored two runs on an error, but then left the tying run on first to end the game. Alea White got the start in the circle and gave up five runs (four earned) on seven hits and a walk in six innings. She was relieved in the seventh by Cierra Word, who threw a scoreless inning on two hits. The game one loss was the Knights’ first season-opening loss since 2013. UCF wasted no time getting on the board against Butler in game two, scoring four runs in the first frame. Glover got things started with a single that drove in Cassady Brewer. Brooke Barlow then scored another run with a groundout before Erin Emanuel brought two in with another groundout. Emanuel picked up another RBI in the third with a single to center. White found better results in game two as she returned to the circle. She tossed a complete game, giving up just one run on 11 hits and a walk while striking out five. UCF returns to the field on Saturday for two more games, first facing Providence at 1:30 p.m. before a meeting with Illinois at 6:30 p.m. The Knights wrap up their weekend on Sunday at noon against North Carolina. All games are in Longwood, Fla. Worried about UCF Football’s 2018 Signees? Don’t Be.